Bhanoo, Sindya N. (2013-03-25). "The Secret May Be in the Coffee". New York Times. Retrieved December 4, 2013. Osterweil, Neil. "Coffee and Your Health". WebMD. Retrieved November 24, 2010. Benjamin Joffe-Walt and Oliver Burkeman, The Guardian, September 16, 2005, "Coffee trail"—from the Ethiopian village of Choche to a London coffee shop. This is Coffee—Short tribute to coffee in the form of a documentary film (1961), made by the Coffee Brewing Institute. The movie includes some dos and don'ts of making "the perfect cup of coffee" and an overview of different ways to enjoy coffee throughout the world. An Illustrated Coffee Guide—Side-by-side diagrams of a few common espresso drinks. F. Engelmann, M.E. Dulloo, C. Astorga, S. Dussert and F. Anthony (2007). Complementary strategies for ex situ conservation of coffee (Coffea arabica L.) genetic resources. A case study in CATIE, Costa Rica. Topical reviews in Agricultural Biodiversity. Bioversity International, Rome, Italy. http://www.bioversityinternational.org/index.php?id=19&user_bioversitypublications_pi1%5BshowUid%5D=3087. Coffee Taster, the free newsletter of the International Institute of Coffee Tasters, featuring articles on the quality of espresso, chemical and sensory analysis, market trends. Morris, Jonathan (2007). "The Cappuccino Conquests. The Transnational History of Italian Coffee". summary. Booknotes interview with Mark Pendergrast on Uncommon Grounds: The History of Coffee and How It Transformed Our World, August 29, 1999. 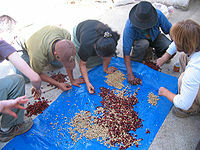 Articles on world coffee trade at the Agritrade web site. A study on the chemical analysis of coffee and caffeine content, using chromatography, spectroscopy, rheology, thermal analysis, and free radical content measurements, and sol/gel. Archived from the original on 24 March 2014.